Its t-minus two days right now. ?I started writing this article before the big day, but you won’t be reading it until after. ?You’ll see it switch from future to past tense, but you’ll figure it all out. 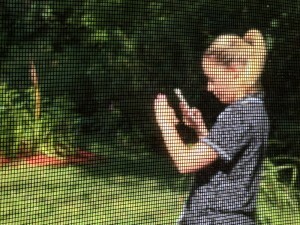 My girlfriend has always appreciated the idea of simple living. ?She has been a long time fan of Little House on the Prairie. ?If you don’t know (meaning you?re under a rock), it was a tv show, that is based on a series of books, based on the real life of Laura Ingalls Wilder. Some of the books take place in Walnut Grove, Minnesota. She discovered that Walnut Grove was a ‘quick’ 6 hour ride from Madison (dirt roads and all), and she had to see it. ?I have been considering proposing to her for months, but have been looking for the spot, the time, and the way to do it. ? ?When we discussed this vacation and how far the roadtrip would be, she told me ‘I may never be able to see it again’, so at that point I realized this was a place that will be special for her. It just so happened that this was one of the weekends of the annual Wilder Pageant, by and large the biggest attraction of the area. A little about her – she’s one of the funniest people I know. She?s unique, and she’s quirky in the best ways possible. (Sidenote: my Aunt once told me that she knows I’ll one day marry a quirky girl [to match my own quirks], she told me this about 15 years ago for whatever reason). Anyhow, so whatever I was going to do – it had to be unique, it had to be special, it had to fit her (no hot air balloon rides or proposals under the Christmas tree). 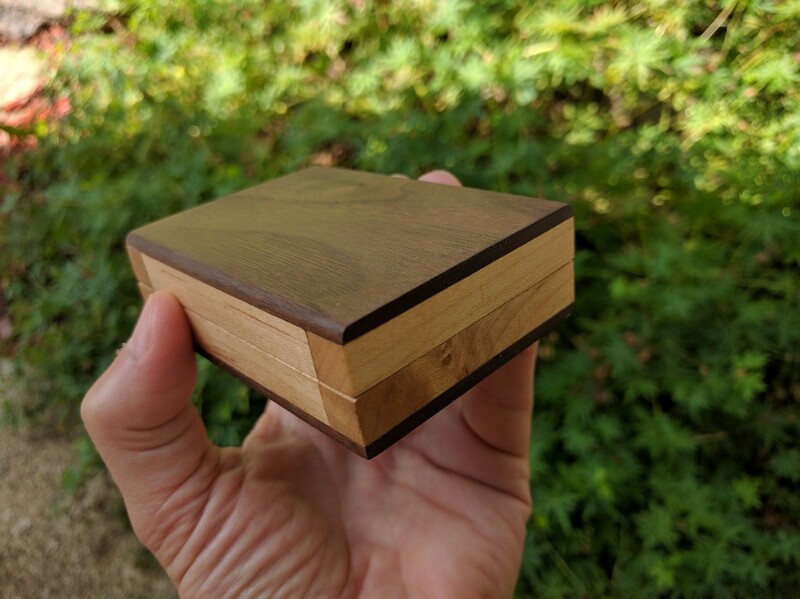 Handmade walnut and maple wooden ring box. Her birthday just passed (while she was on her trip, so we didn’t spend it together). ?For weeks I have told her that I’m “making” her a birthday present. ?Its true I have been making something. I had wanted to buy a handmade slim wooden ring box, so I don’t have to hide a big clunky one. I tried to order one – but they couldn’t make it big enough for the ring (I know, right? ), so I figured I’d make it myself. ? ?So I’ve spent many many hours in my basement handcrafting “a small walnut box”, I think it didn?t turn out half-bad. ?I actually took the opportunity to listen to a reading of one of the Little House books cover-to-cover. ? So this is what I?ve really been ?making?, but she?ll think its something else that I?ve been working on. ? One of the books in the Little House series is titled ?On the Banks of Plum Creek?, I had my mother send me a copy and I read it for research about the writing and illustration style. ?I also ordered her a vintage copy of the book and this will be the ?birthday gift? that I?ll give her literally ?on the banks of Plum Creek?, just outside of Walnut Grove. ? ?After presenting her the book, I?ll be giving her an additional gift – what she?ll be thinking is what I was ?making? for her birthday. ?? That’s a drawing of my little house. 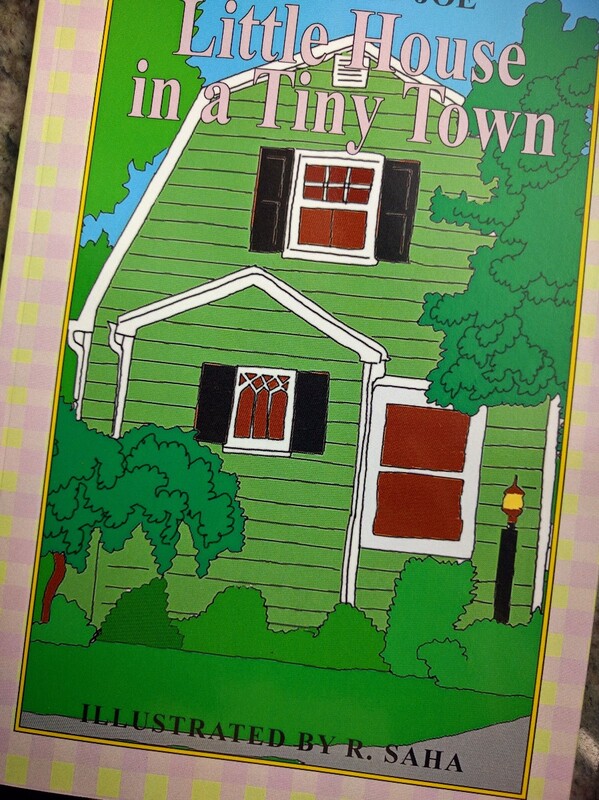 I live near an area called ‘Tiny Town’ – trust me, it all makes sense. I wrote a book. I have a little experience with self-publishing, its a small book, about 20 pages, with a sentence or two per page. ? ?I had it illustrated loosely in the style of the Little House books. ?The title of the book is ?Little House in a Tiny Town? (my little house is located very close to a historic area referred to as ?Tiny Town?). ?The book has some quotes from Laura Ingalls, and some small highlights and drawings of our shared appreciation of the simple things of life. ? Near the end, the book leads to a drawing of us walking along the banks of Plum Creek. 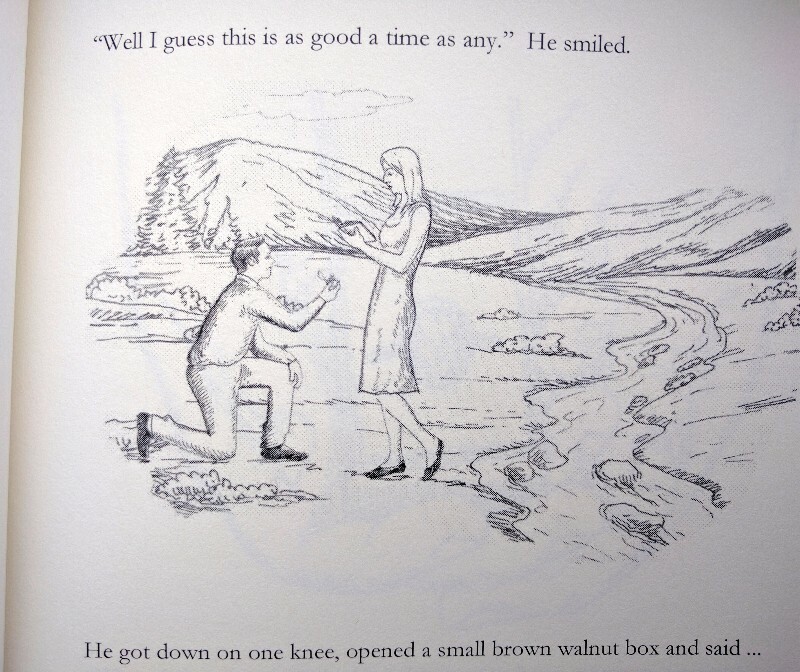 ?And finally comes to a drawing of us, right there in that spot, her reading the book, and me proposing to her. ?Boom. So, it was all really simple, just write a book, orchestrate a dozen illustrations with an artist in Bangladesh, build a wooden ring, meticulously plan every minute of a whirlwind day touring thru the sites of Walnut Grove. ?? The ring is a whole other story, its custom made, and as of this moment I don?t have it ? it is being Fedexed to my destination and I?ll have it in the morning. ?Ironically, I?d bet its flying on the same flight out as me. ? (One day later: I have it now, and it’s perfect). So as I write this, I?m on a three hour delay in LGA airport and the businessman next me me started chatting me up. ?We talk about our work, and I learned that he is a PHD in Physical Chemistry and is in New York for a job interview for a position that’s focus is the technical analysis of diamond authenticity. ? Since it couldn?t seem any more appropriate – I told him what my trip was really all about. ? ?We talked about my diamond. ?As he asked me some questions about it, ?he unintentionally made me realize that I probably understand next to nothing about diamonds in spite of what google has helped me with. ?He was explaining the science in pretty technical detail, he even showed me powerpoints, articles, and technical documents about diamonds. ?? 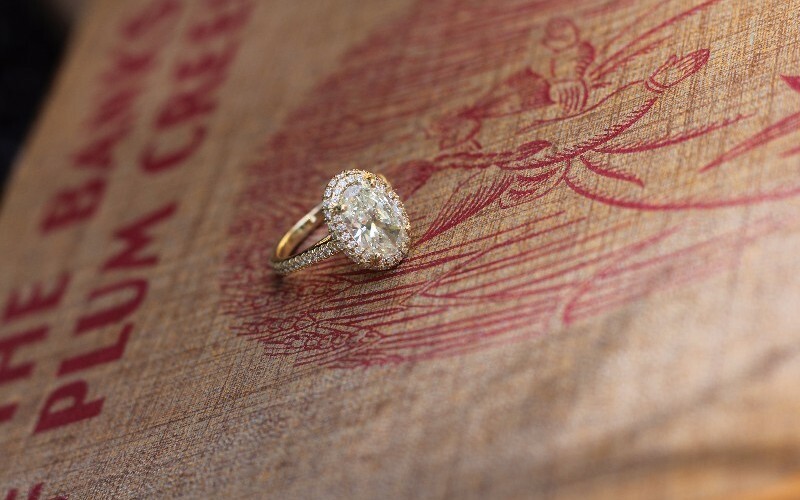 Is there a relevance to my story, nah not really – ?but if there was any uncertainty in whether or not the stars are aligned, I?d say that having a half hour conversation with a random guy who happened to be a diamond expert while on my way to go give a diamond away – could be a ?sign? of some sorts. ? 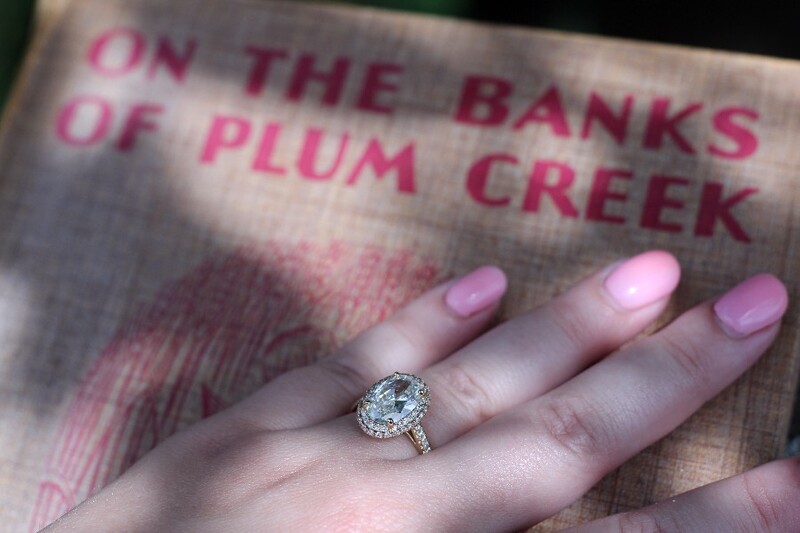 Back to the story… somewhere “on the banks of Plum Creek”. 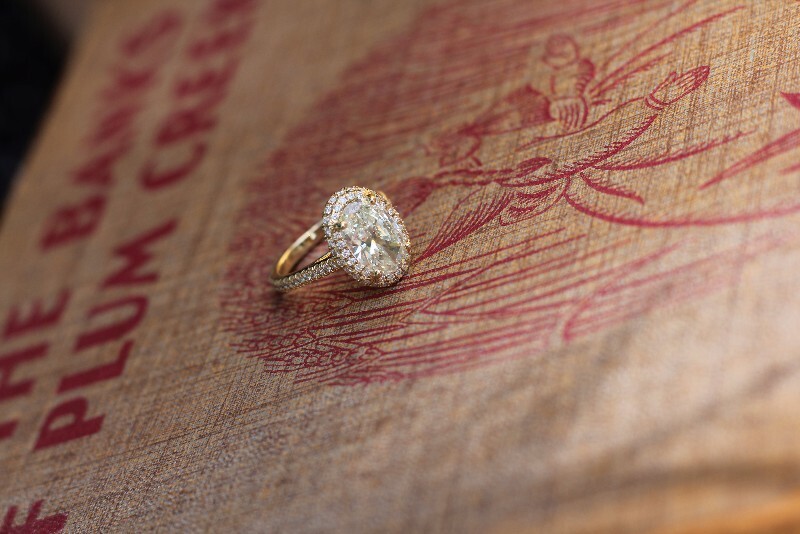 Custom setting of yellow gold, with a double halo, cathedral setting, oval stone, pave wrapped 3/4 around with u-channel settings, and diamond covered stand-offs on the bottom. So, it’s all over (or just getting started, I guess) – how did it all go? It actually went mostly went to plan. ?I?ll leave off some of the details and just tell you about the biggest hiccup. ? The creek area is fairly small, you can walk thru it in 25 minutes and have seen just about everything. ? ?So as we did one lap around and were heading back (where I scoped out a good spot), she got a phone call, from her father. ?He knew I was proposing, but may not have realized the exact day and time. ?The phone call was about an innocuous topic for about 5 minutes (as I waved at her to tell him to call him back), but then at some point she started looking at me funny. ? ?It was more than just a suspicious look. ? ?After she hung up the phone, she said ?What are you planning??. ?She told me her father said ?I just want you to know I support you with whatever you are going to do?. ?That’s nice and all, but oh boy. ? Yada-yada-yada, he didn?t realize he was ruining a surprise just minutes before it was about to happen. ?The plan?s element of surprise was sorta lost in translation with him, and he hadn?t realized. ?So now she was grilling me asking me what he?s talking about. ? ?As poorly as I played it off (cool as a sweaty cucumber), I said that I dont know why he is bringing this up now, he shouldn’t have been talking about it at all, but that it was for something in the future, and no its not going to happen on this trip (fingers were crossed – doesn’t count). As we talked about things for a few minutes and I danced my way thru questions like ?did you buy the ring yet? (its in my pocket)… I brought her to a spot that really seemed most appropriate, right there – on the bank of Plum Creek. ?From that part forward – the plan went ?as planned?. I gave her the vintage book, followed by my book she read it with a big smile. As I flipped to this page, that’s when I did my thing. I flipped to this page and took it over from there. 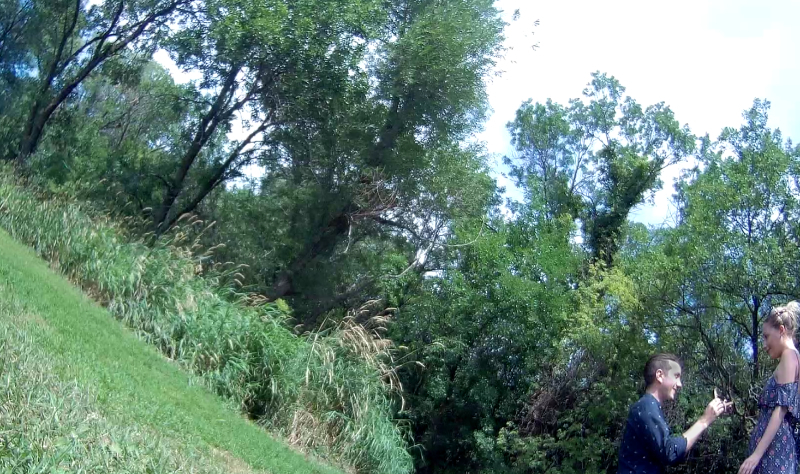 The real moment, roughly captured with my hidden stashed go-pro camera… trust me the creek is right there. So, all in all, as far as executing a plan goes – I think it was a success. ? It was also nerve-wracking, so I’m glad its a once in a lifetime kinda thing. I keep catching her doing stuff like this, I think it means she likes it. It?s amazing how just how many people played both small and large parts in helping to make this happen. ?Below is the acknowledgement I included in the book. Jon showed how to get the perfect stone. ?Matt tirelessly and expertly helped to find it. ?Jackie designed the setting. ?Lynda got together all the details to make it happen (Jewelers from ‘Good Old Gold’, Massapequa NY). Stephanie orchestrated getting it into my hands. ?The Wilder Pageant gave ideas on how to make this moment special. Amy from the Laura Ingalls Wilder museum helped to dream up some proposal ideas. ?Sarah S. Uthoff, a Laura Ingalls Wilder expert wrote a page full of amazing ideas. ?An elderly man in a Minnesota nursing home consigned his 1937 vintage copy of On the Banks of Plum Creek to ?Books by Janie?. ?On learning what the book was for, Janie rush shipped the book (for no reason other than shared excitement). My mother shipped me a paperback copy of the same book so I can do research ahead of time. 40 artists replied to the request to illustrate this story. Ankur Saha, a freelance artist from Bangladesh perfectly illustrated the story in the style of Little House. ?My friends and coworkers supported and encouraged me through the process.